Cook the pasta according the package directions. Drain and rinse immediately with cold water to stop the cooking process. Prepare vegetables according to the recipe list. Toss cooled pasta with the vegetables. Prepare the honey ginger soy dressing by mixing all ingredients and whisking until well combined. Toss pasta and vegetables with the dressing. If desired, chill before serving. Last year we decided to grow our first garden. I have always loved sugar snap peas, but they're usually pretty pricey at the grocery store so I decided that I wanted to try growing them in our garden. With the garden situated on the side of our house, we had the perfect iron gate that the peas could climb. I love eating the peas straight off the vine, but I really enjoy making stir-fry and this pasta salad with them too. 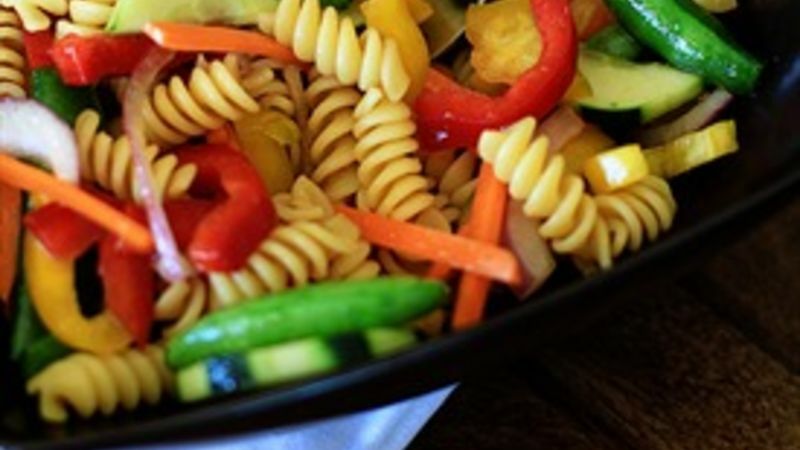 Pasta salads are a great way to bring variety into spring and summer meals. With so many fresh vegetable choices available, it's easy to these fresh tasting salads. Crunchy Asian Pasta Salad is one of our favorites. The cool, crunchy vegetables in this pasta salad are a great way to keep the summer heat away. And it's incredibly healthy too with all the different colored vegetables. Experts now recommend that you try to incorporate all the colors of the rainbow in your daily fruit and vegetable choices. This recipe has most of them covered! For added health benefits, choose whole wheat pasta. With the success we had last year with peas, we decided that we would enjoy them in our garden again this year. I planted over 30 plants along our iron gate. This year we wrapped the gate in chicken wire to help the peas climb even better. So far we have been able to enjoy this salad a few times thanks to our garden peas!